Landscapes serve as both subject and inspiration for my work. Formed under the pressure of our touch and shaped by our thoughts and actions, landscapes become cultural records of what we value and of what we don't. Through experience, all landscapes become personal, and the cultural narrative becomes context for our personal one — places experienced become places remembered and what is memorable acknowledges the significance of that place in our lives. In my work, memories are transfigured into impressions of places unencumbered by form and detail. Sometimes my impressions accumulate over many encounters with a particular place; sometimes they build on themselves and evolve; often they blend into a montage of places once distinct. 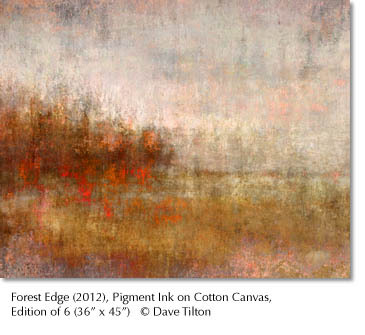 Through the use of color, form, and texture my art explores how memories re–form themselves into landscapes filled with suggestion, mood, and sumptuous beauty. Ambient (September 2012) or Remembered Landscapes (September 2010). All material copyright ©2008-2016 by Carta StudioWorks, LLC or Dave Tilton. All rights reserved.